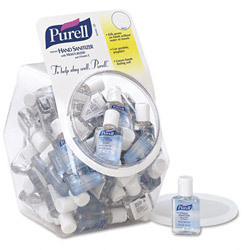 Today’s Daily Deal discounted item is a display bowl with 60 half-ounce bottles of Purell hand sanitizer, today for only $40.95. That’s only 0.67 cents per bottle! The display bowl of hand sanitizers is appealing to everyone and is an ideal upsell item for your cashier counter. They say an ounce of prevention is worth a pound of cure, so these half-ounce sanitizers are more than worth their price! Protect yourself from 99% of the most common germs that make you sick, on the go. Use it on the bus, in public restrooms, and any high-traffic area where germs are easily spread. Read the Purell user reviews for testimonials on the effectiveness of this product. Purell products are America’s number one choice for protection against germs and viruses like H1N1. Don’t take a chance on your health! Take advantage of this Daily Deal before it expires.